The Style Chicks love tea. The Style Chicks love glowing skin. The Style Chicks love not feeling incredibly sore after Arm Workout Day. The Style Chicks love organic, all natural products. For all of these reasons and more, Style Chicks love Amoda Organic Golden Turmeric Ginger Herbal Tea. 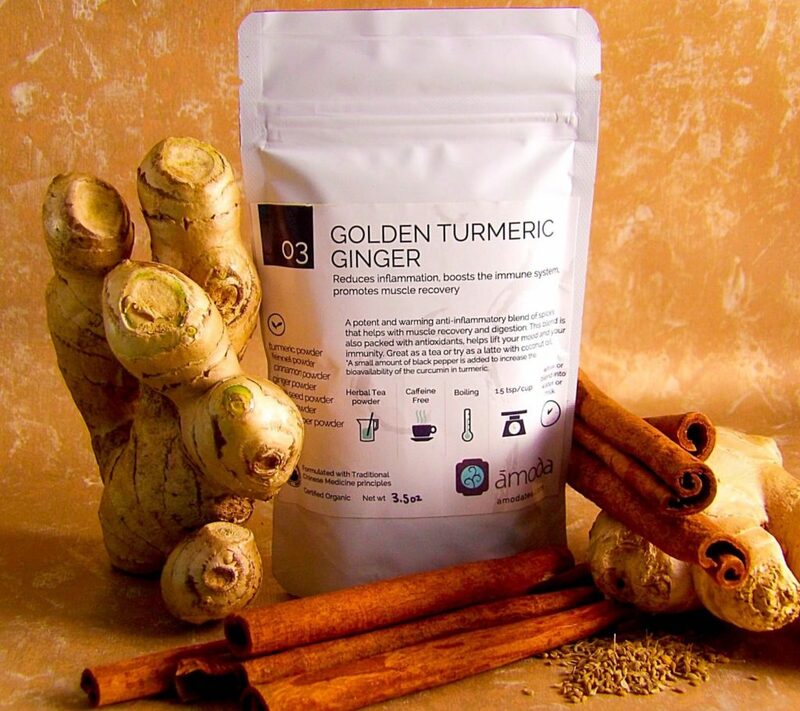 Amoda Organic Golden Turmeric Ginger Herbal Tea is a magnificent blend of organic powdered turmeric, ginger, fennel, anise seed, true cinnamon, and vanilla. Sounds like a Chai variant to you? It is along that flavor line, but it packs far more flavor, not to mention health benefits. It is pretty rare that I find a chai tea that tastes as good as it smells. This herbal tea actually tastes better than it smells, and it smells amazing! 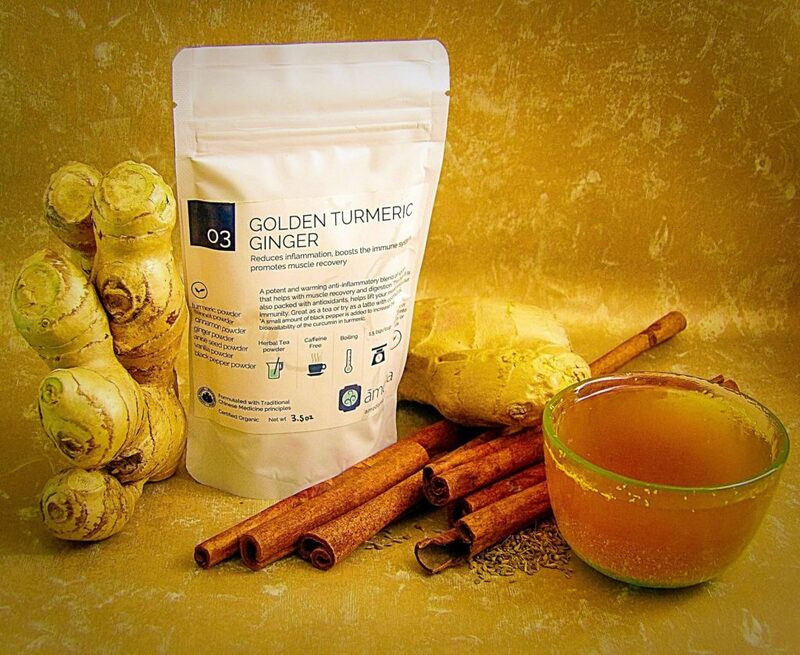 The anti-inflammatory benefits of the ingredients, especially Tumeric and Ginger, are well documented. I take Tumeric supplements for its’ anti-inflammatory effects, but I am trying to use high-grade Tumeric in cooking more to get the most benefit from it. I also try to incorporate fresh ginger into recipes as much as I can. But what I like about Amoda Organic Golden Turmeric Ginger Herbal Tea is that it contains high-grade powdered ingredients (with no additives!) in an easy to use way that incorporates seamlessly into my tea-drinking lifestyle. I stir the powder into hot water and enjoy the spicy, savory treat while getting an incredible amount of healthy anti-inflammatory benefits. I love that it doesn’t feel like I’m choosing the healthy option, but rather than I’m choosing the tasty option. The benefits have been impressive. My skin is glowing. I had an angry blemish that was painful and very red. After a few days of drinking this tea, I noticed that while it wasn’t full flat yet, the redness had disappeared. Usually, blemishes stay red far beyond when they are flat on me, and the redness disappears over time. Because of the powerful anti-inflammatory effects of the tea, the blemish is flesh tone and far less noticeable! My under eyes have also shown marked improvement. During Fall allergy season, my eyes always get puffy, and for the past two weeks, my orbital skin has been puffy and dark. The tea de-inflamed the area, and my eyes look great! How the tea affects muscle recovery is also profoundly impressive. After a good Tracy Anderson workout, I tend to feel run over by a truck the next day. If I drink this tea as my recovery drink, I feel substantially less sore. It’s not just power of suggestion, either. I had a shoulder injury that leaves the joint quite inflamed. Last night I put my hand on the affected shoulder while I was in the middle of a conversation, and it was significantly less swollen than normal. Though I was absorbed in the conversation, the reduction of inflammation was enough to make me lose my train of thought. It took me a couple of minutes to realize that it is likely due to this amazing tea! Not to split hairs, but technically this is a tisane since it is an herbal tea, not a true tea since no actual tea leaves are involved. However, this opens up options. If you want the health benefits of green tea but dislike the taste, try addition this mix into your tea, and the vegetal taste is greatly diminished. Lyn and I acquired a taste for straight green tea over time, but it took awhile (especially when we got into Matcha.) So if you are looking to start drinking green tea (or any tea), adding this mix turns a regular cup of tea into an amazingly tasty, incredibly healthy taste treat! Mom tried it today and loved how full-bodied it is. She doesn’t like tea as much as Lyn and I do because it is, as she calls it, a “thin-bodied” beverage. She loves this tea because it is full bodied (think Hot Apple Cider straight from one of the many amazing New England orchards) and she considers it more of a savory snack for break time rather than just a hot beverage. So, if you are looking to cut out some calories by ditching your carby, sugary afternoon snack and want to replace it with a tasty, satisfying, healthy drink, this is ideal for you! Lyn found that it had similar results for her in that it cut out her craving for a buttery carb mid-afternoon. As a family, buttery carbs are held in high culinary regard as a treat, so this is truly a testimony to this tea! And don’t forget, it is all plant-based, organic, gluten free, dairy free, vegetarian and perfect for vegans! Find this lovely tea at https://www.amazon.com/dp/B01HQWM6ZG?th=1. Every fall since we were young, a family friend with a small apple orchard has served fresh apple cider mulling in her home whenever company came over. The delicious aroma has always been heavenly. As her guests file in, she greets them with a warm mug of her mulled cider with a cinnamon stick in it, and guests young and old gather around the fireplace hearth and sip the tasty brew. Nobody knows her secret recipe of spices; she just keeps the spices and cider at a low, rolling boil for a few hours, tending to it in between greeting and serving each of her guests. Nothing beats a warm drink with fall spices after being outside on a cold, crisp day. During this season, there are lots of opportunities for entertaining ranging from formal events; family get-togethers and even informal tailgating parties and football games. A common theme in all of this is welcoming guests with a delicious drink that everyone can enjoy. A tasty and traditional drink of the season is either Mulled Wine and Mulled Cider. Mulled Wine, originally the drink offered by generous and well-to-do wealthy households in medieval times, it has seen various incarnations over time. A combination of favorite autumnal flavors such as Cinnamon and various spices taste especially good when simmered in apple cider, claret, port, or in a signature drink of your creation. Still a popular tradition today, in the hustle and bustle of entertaining, this charming drink sometimes get overlooked due to time constraints while cooking a large meal for many guests. To enjoy the taste of a simmered mulled drink without having to allocate excess prep time during a busy meal or gathering, consider a tasty Mulled Spice preparation to kick-start your simmered warm beverage options. These bags come eight to a box and are as easy to use as a tea bag. These bags quickly add the flavor and taste of what normally takes a hostess’ watchful eye to maintain a rolling boil on the spice steeped beverage to achieve a full bodied, evenly simmered, not too sweet mulled beverage. 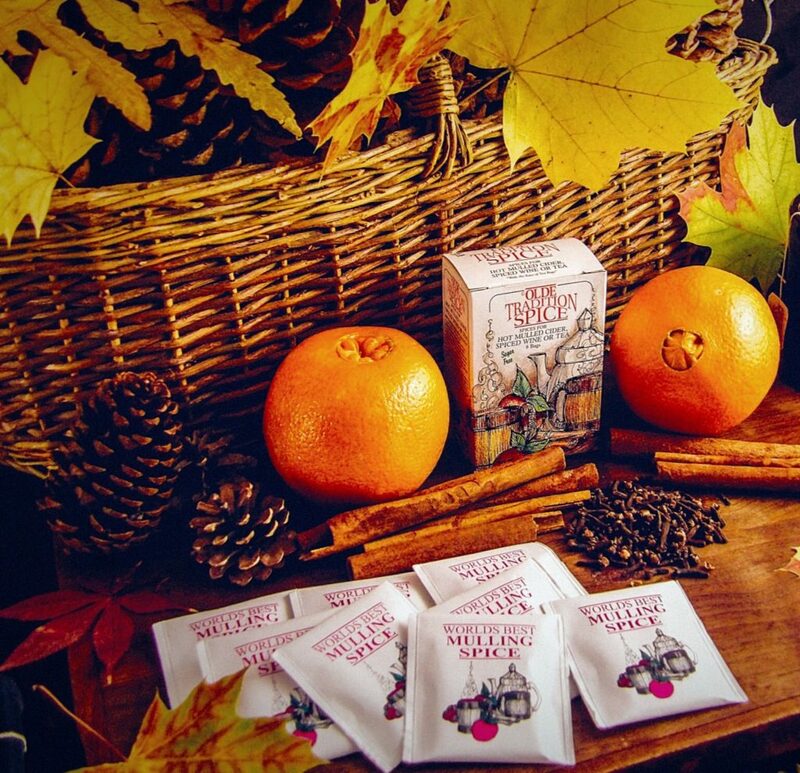 If you would like to enjoy being with your guests instead of babysitting the mulling process, the Olde Tradition Spice Mulling Spice Tea Bags is a great option for you. I was surprised at how much this tastes like the combination of spices used in my apple orchard friends’ cider recipe. A natural and healthy combination of Cinnamon chips, orange peel, cloves, allspice and pure orange oil both smell and taste delicious. It tastes homemade but is very simple to make. 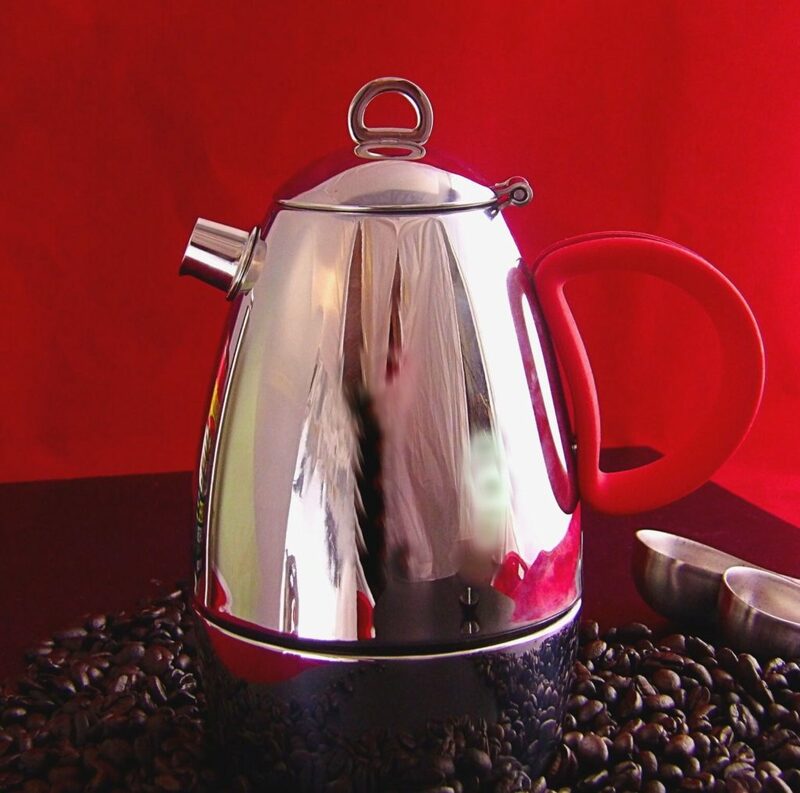 Unlike other commercial preparations, there is no added salt or sugar, and it is caffeine free. Add sweetener to taste. Of course, if your family enjoys any special additions to your signature brew, you can always add in raisins, orange slices, sliced almonds, a pinch of ground ginger, cardamon, and if you prefer to go sugar-free, a vanilla pod for some sweetness. But just adding the bag directly to your brew of wine or cider imparts plenty of flavor. And, as a side bonus, the mulled spices make the house smell delicious, warm and inviting to guests. Traditional known to be included in mulled wine or cider, the Mulling spices can be used apple juice or other fruit juice, red or white wine, and tea to make a delicious mulled drink. The OldeTraditionSpice.com website has a whole list of recipes to choose from (both alcoholic and non-alcoholic) so that the kids and designated drivers can still join in on the fun. Recipes include Hot Toddy, Hot Buttered Rum, Hot Apple Toddy, Hot Buttered Scotch Toddy, Caramel Apple Smoothie, German Wassail, Eggnog, Holiday Apply Cranberry Punch, and Spiced CoffeeLate, amongst many others. I counted about seventeen non-alcoholic recipes so the whole family could enjoy. It is also tasty as a straight drink when used just like a tea bag in hot water. Steeping a mulled spice bag in green tea is a great way to make the vegetal taste of green tea more appealing to kids without using lots of sugar. It also adds a nice taste to ginger ale and can be served cold. Any of these options make for a nice mulled drink for kids during the festivities. The bag can also be cut open and the contents used as a seasoning in cooking or baking. As seen in the video, the spices are a good size and not the “dust” remainders of the respective ingredients. 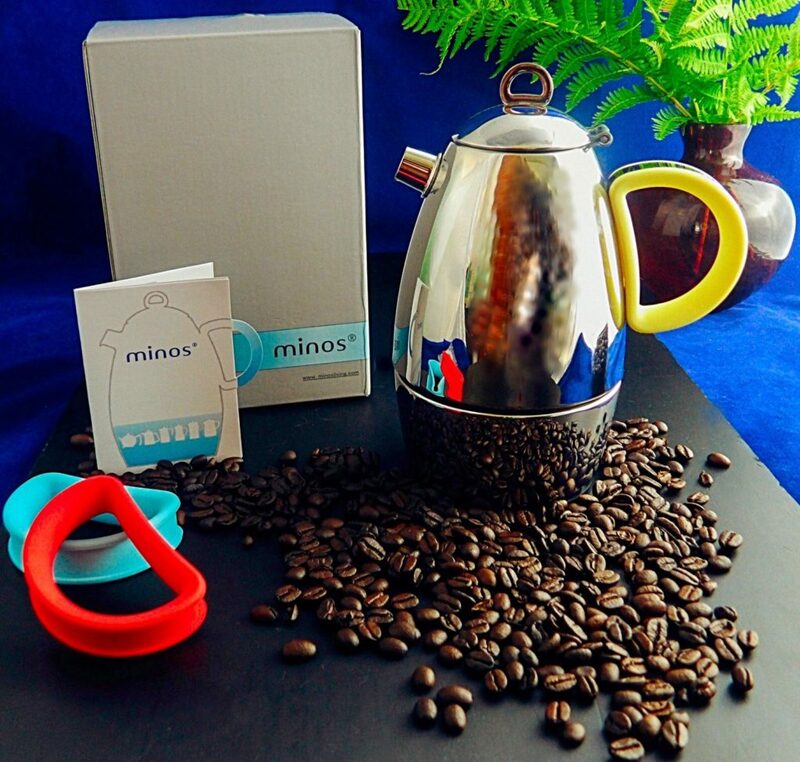 Each bag can be used two to three times or can be used to steep a larger quantity of liquid. In reviewing their website for mulled spice recipes, there was something else interesting I liked about the makers of this product. Olde Tradition Spice, Inc., does community outreach by employing Americans with disabilities for their packing process for various products. The company also stands by using natural and wholesome ingredients to create a product that tastes homemade. CONCLUSION: I like to be able to make a tasty mulled drink, alcoholic or not, quickly and easily, whether brewed for a large group of guests or just one cup for myself. 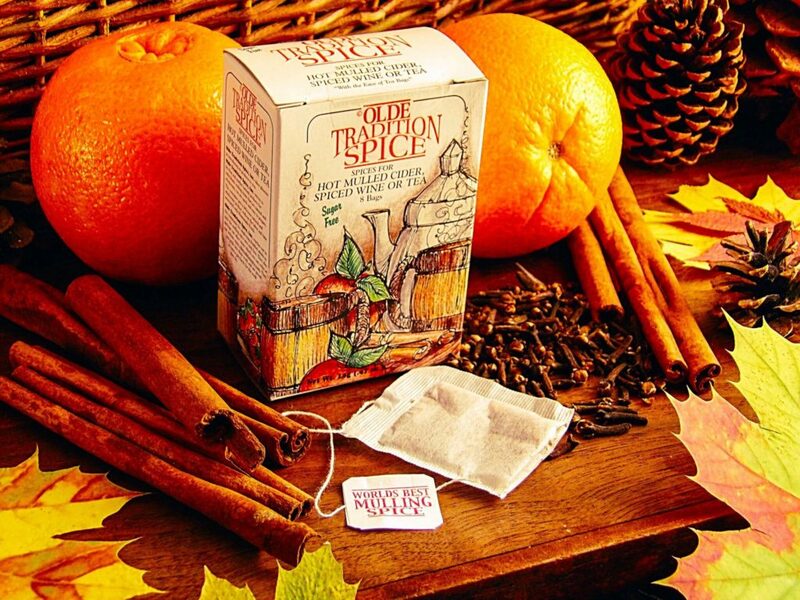 The Olde Tradition Spice Mulling Spice Tea Bags smell and taste delicious and smells homemade. I like the option of being able to serve mulled wine to adults and have a similar tasting mulled cider or tea option for kids or those who choose to opt out of drinking. This mulling spice is a nice treat to have tucked away to entertain unexpected guests or to quickly make an inviting beverage during the cooler season. 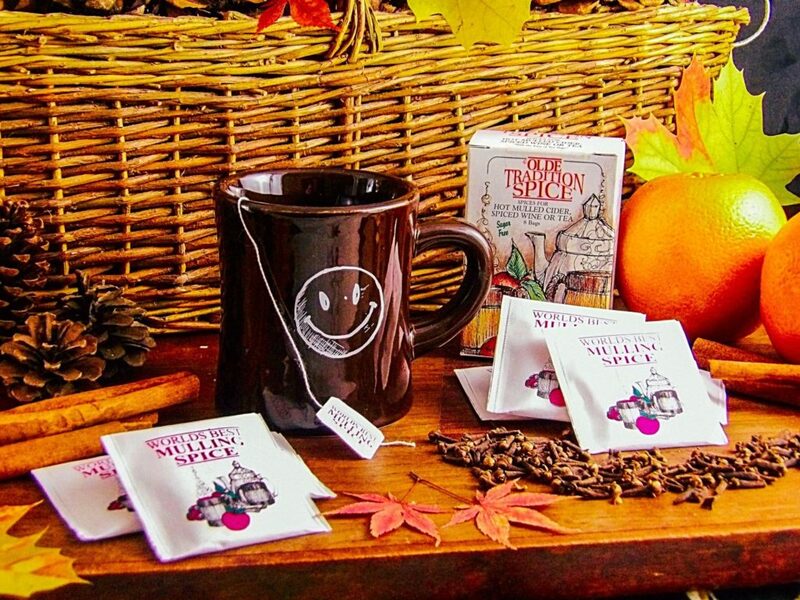 Find Olde Tradition Spice Mulling Spice at http://OldeTradtionSpice.com. And stay tuned to Style Chicks, as we will be featuring our favorite recipes made with Olde Tradition Spice Mulling Spice in the next few weeks, ranging from Mulled Wine to amazing Spiced Green Tea recipes! I have an epic digital music collection. I’ve collected since 1997 (all legal, of course.) I also subscribe to several music streaming services so I can always keep my playlists fresh and exciting. So I’m not going to settle for mediocre sound. That is why I am thrilled to find the powerful and crisp August Multiroom WiFi Speaker. 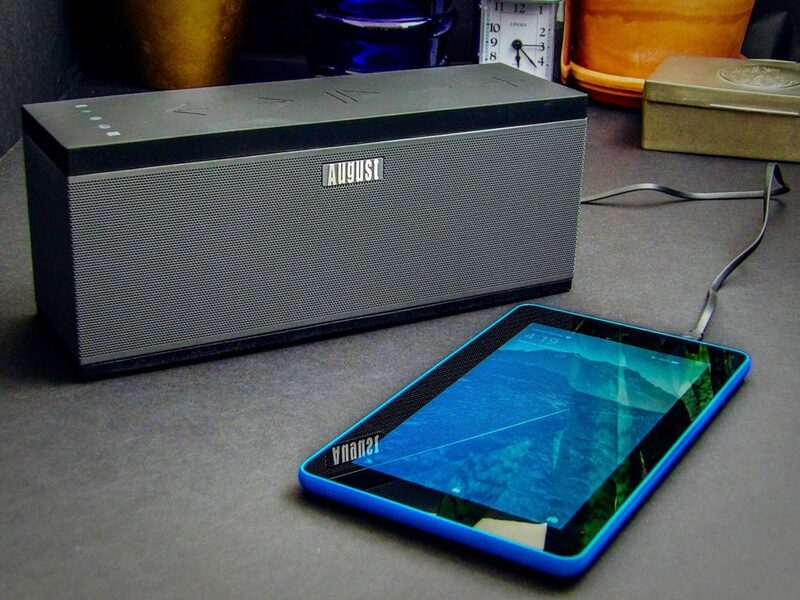 This model is a lightweight but an extremely powerful speaker with deep bass and clear sound. 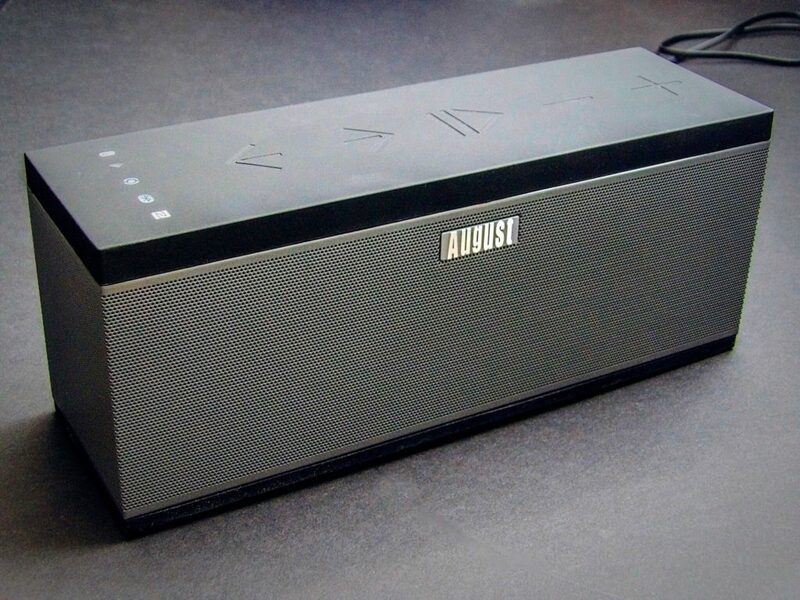 It is a multi-room speaker in that it can be brought anywhere wirelessly. This speaker has several ways to have sound transmitted to it. The first is WiFi. Through August’s easy to use app, you can configure access to your wireless network easily. My wireless has a pretty robust security layer, but it was fairly effortless to configure and stream music over WiFi. This works out fantastically when I stream music off of my desktop in the office and bring the speaker into the kitchen while I’m cooking. It also works via Bluetooth. 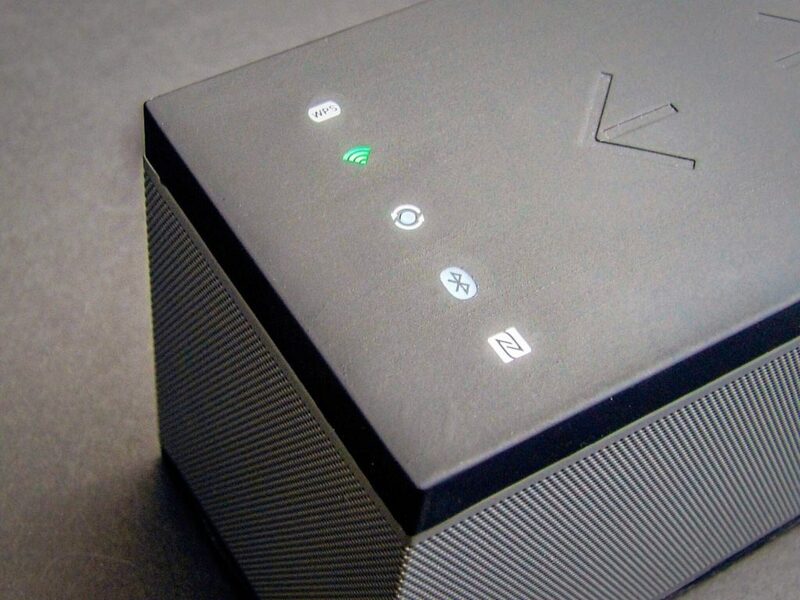 Pairing the speaking with via Bluetooth is incredibly easy, and it automatically connects after the first time it is set up. If I’m relaxing or taking a spa afternoon, I enjoy using the speaker with a playlist off of my iPhone streamed via Bluetooth. Using it on Bluetooth is also perfect for picnics or other outdoor events where you don’t have WiFi available. 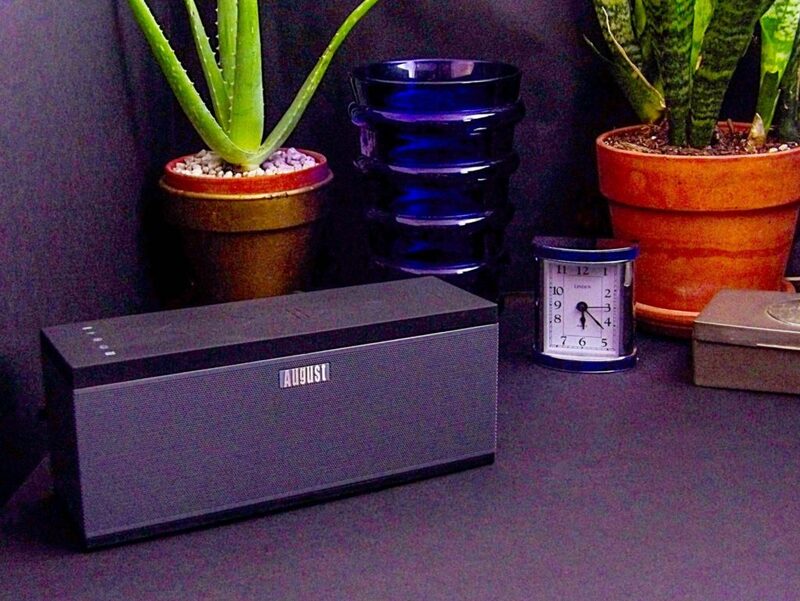 Another way to use it off of your iPhone is Airplay, which works very well, and it has an AUX connection to connect directly to a device. While the rechargeable battery is supposed to last 22 hours, I have used it for far longer between charges. The charges go quite fast (via USB), and the unit can be used while charging, so your unit will never be out of commission. To get truly fantastic sound, I recommend getting two of these speakers. 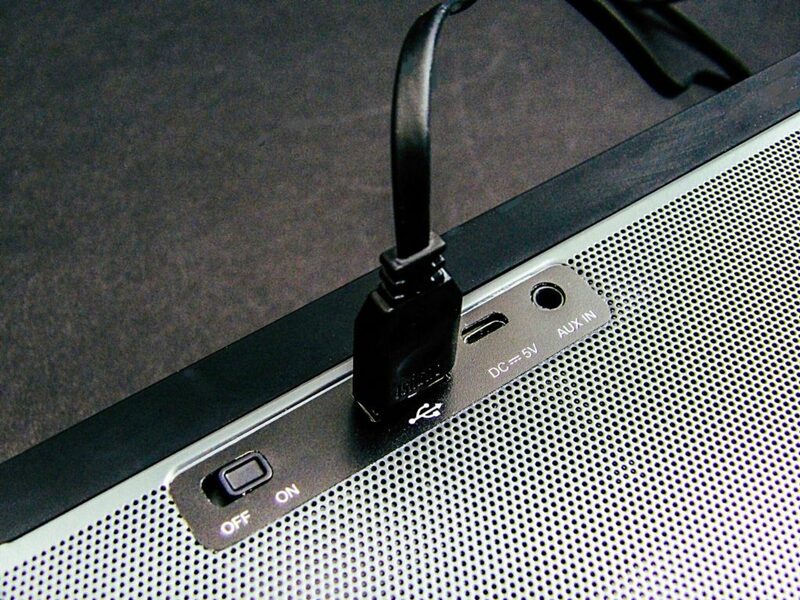 You can designate them as left and right speakers for a true surround sound. One of my favorite uses is as a sound system on my TV. I tend to watch a lot of movies on my laptop, with a full satellite and subwoofer system attached, so I’m used to good sound on movies. The sound isn’t terribly good on my TV, but using this speaker adds a nice resonance and depth to the sound when I stream movies. As I mentioned earlier, the app is easy to use. It lets you configure several streaming services, including Spotify, Tidal, Tune In, and iHeart Radio. I am a big user of Amazon Prime Music, which would be a nice addition, but I haven’t had any problems at all streaming Amazon Music from my devices. I am thrilled to have found such a versatile and impressive speaker system. I use it daily and plan on purchasing more in the future both for myself and as gifts. Who doesn’t love an alfresco meal at the beach or favorite outdoor spot? The mental picture of a beach day or impromptu picnic always presumes that the ground is warm, dry and comfortable. But the reality of sitting on the ground is it is often soggy, sinking and cold with dirt or sand everywhere, including near the food. I have brought a regular blanket, tablecloth or oversized towel all of which tend to get wet when sitting on them. They are also often difficult to clean off all of the dirt or sand, especially if they get wet. Another issue is the wind tends to overturn the blanket unless the corners are anchored, which is something I always forget about until it is too late. These problems are non-issues with the WEIMY Beach Blanket: a sand-resistant blanket that dries quickly and stays put. As a kid, we lived near the beach. We frequently packed lunch or got some takeout and walked the sand picking up seashells for awhile before sitting together and having our meal. I remember it being lots of fun, even when it was cold, and I also remember when it was time to get back into my Dad’s sporty little red BMW. There was one rule: no sand in the car, and no tracking sand into the house, ever. So if we couldn’t shake the sand out of some blanket, shoe, or beach pail, then we got air vacuumed off or hosed off at the gas station before going home. We vacuumed a lot of sand off of those beach blankets and shoes. Fast forward to now and sand still does not come off of most beach blankets very easily. So I was impressed to take this WEIMY beach blanket for a test run on wet sand. It is sand repellant, so the sand is easy to brush and shake off before the blanket is folded back up and packed. No messy sand in the car. 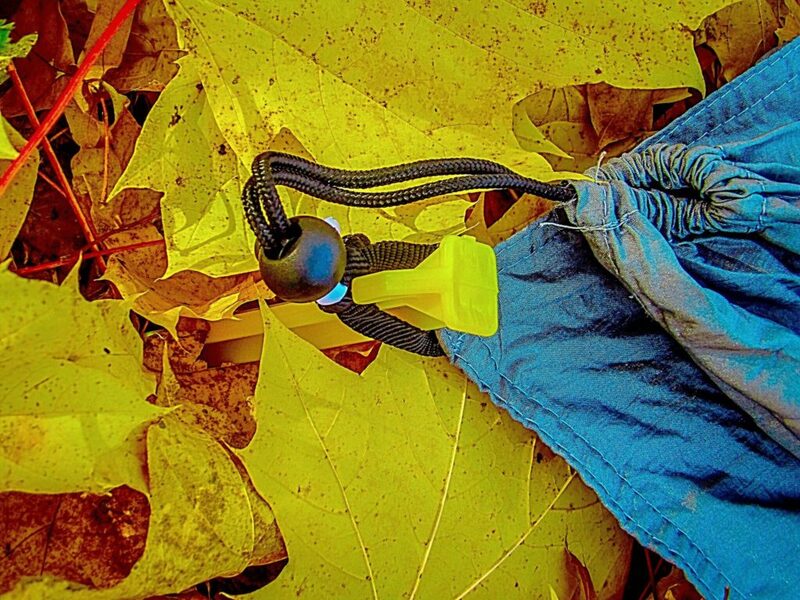 Something I especially like about the WEIMY beach blanket is the four anchor pockets and four plastic stakes that are used to keep the blanket securely in place, even if it is windy. The stakes secure the blanket nicely and are easy to ground in the sand or dirt. We find this ideal for fall beach trips. We have this amazingly fresh seafood stand near our local favorite beach spot. Even when the temperatures start to cool down, we enjoy having our seafood feast on the beach, watching the waves roll in. But not just any old blanket, tarp, or towel can be set up our seafood picnic at the beach because the wind at the shore invariably manages to overturn my makeshift surfside picnic. Even in warmer weather, the wind kicks up too much and everything I could use to weight the corners is often already covered in sand. 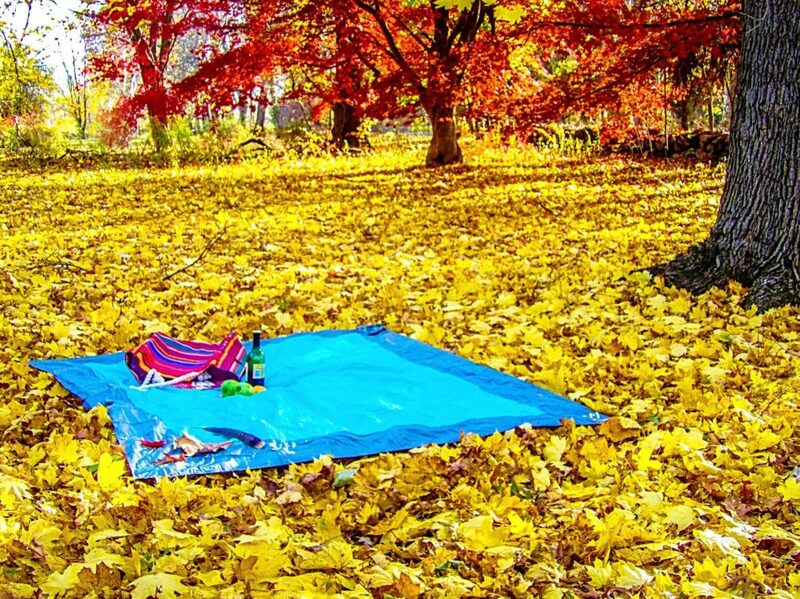 While it is still just chilly enough to enjoy still being outside, a nice way to take a day at the beach, a park, glamping or an impromptu picnic while admiring the fall foliage. The beaches on Martha’s Vineyard, Nantucket, and Block Island are almost always too windy to keep a beach blanket in place, so the WEIMY blanket is perfect to tuck into the beach bag for windy island excursions. The four yellow stakes have a long hook that hooks into the black loops on the four corners of the blanket. The loops are well-stitched securely onto the blanket and so far have not unraveled even when overstretched a bit. The stakes are secured into the sand very easily. I found them even more secure on a slight inward angle towards the blanket. A child could easily secure the stakes on sand. The stakes go into the ground (warm or cold) very easily as well, I could easily slide the stake into the cooler fall dirt with one hand. If it is very cold ground, in either dirt or grass, the easiest way I found was to put them into the ground about an inch and then press the stakes the rest of the way down with my foot. But a stronger person could easily do it with their hands. I like that the bag is big enough to accommodate the blanket after I have used it and refolded it. I have several similar items that I can never get the item back into its’ storage bag after it is unfolded, whereas the Weimy blanket fits back into the bag pretty easily. 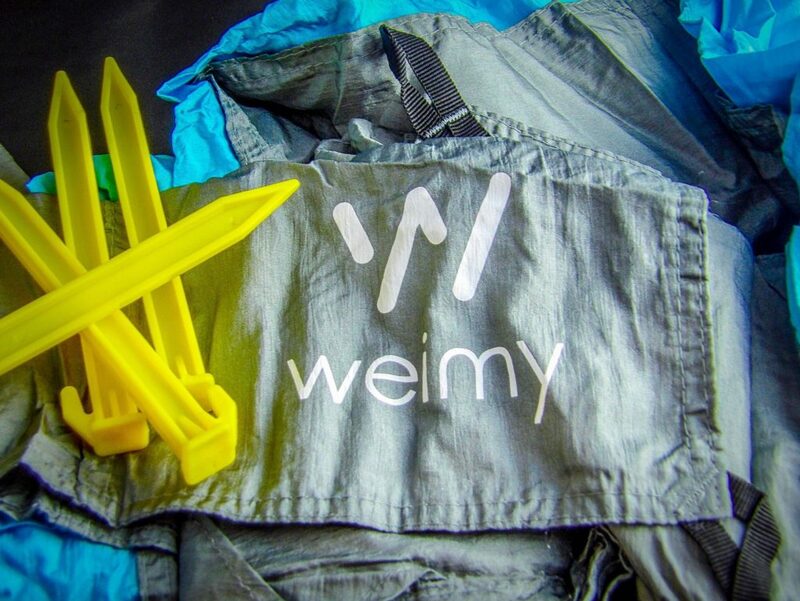 After cleaning (and drying if needed), store the Weimy blanket back in the drawstring bag. To refold the blanket, fold along the small folds first, then roll it back into the size that fits into the bag. In New England, the uses for a beach blanket within outdoor activities are rarely just limited to summer beach days. 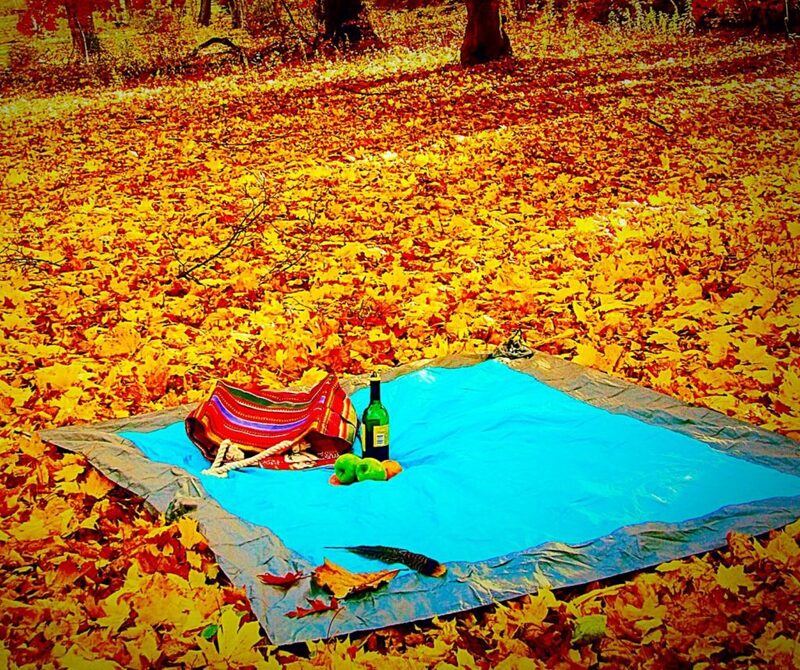 Fall foliage walks often include picnics, as well as astronomy club nights held in a few country spots away from the city lights, where the constellations are clearly visible when laying down a blanket for an evening of stargazing and some perhaps some wine and snacks. Going to a summer music series or outdoor concert? 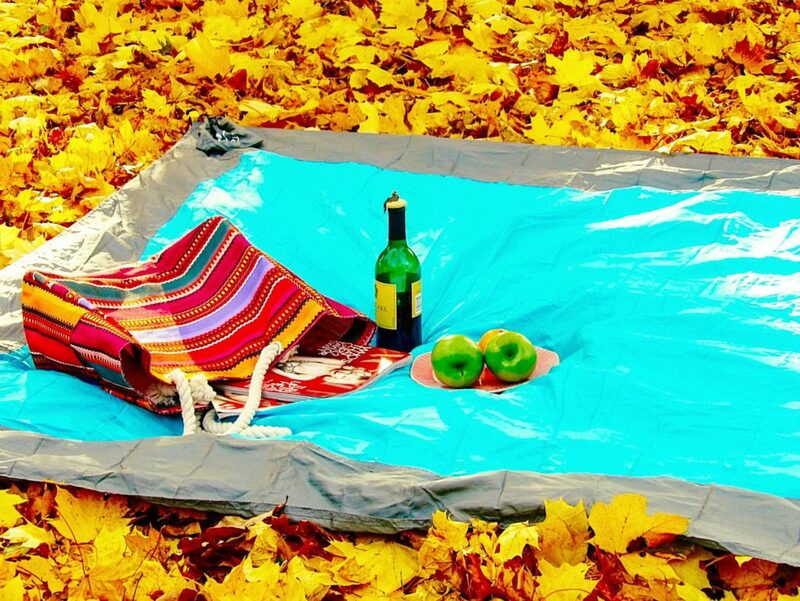 Weimy beach blanket stays dry on the ground and provides a convenient food station for friends and family to put their food and drink while enjoying the show and nobody has to place food or drink directly on the ground. Bridal tip: considering taking the bridal party or first look photos at the beach before the ceremony? I have always wondered how brides and their ladies manage not to get their dresses dirty and their shoes and feet sandy. Instead of risky dress and shoes, discretely secure the Weimy beach blanket underfoot for photo ops to protect gown, train, and shoes. 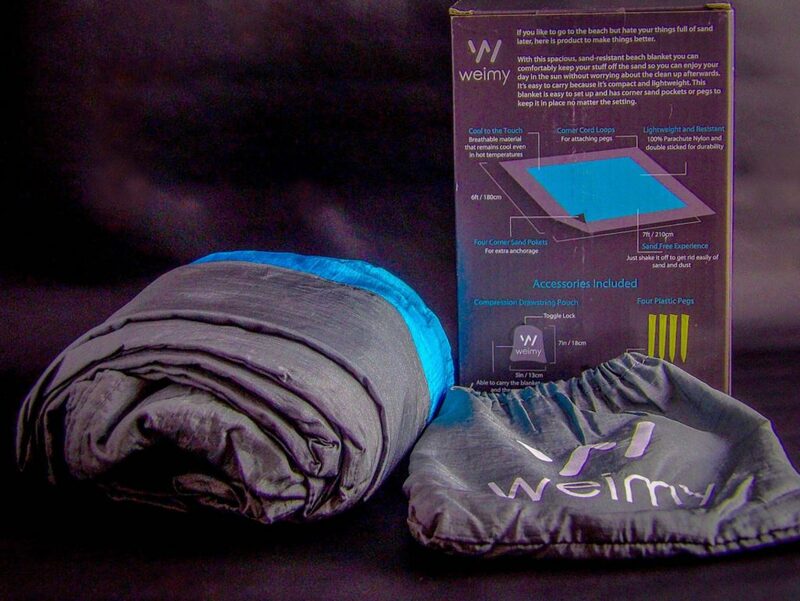 The Weimy blanket is a very versatile, useful blanket for impromptu alfresco picnics, stargazing or going to the beach. The stakes are easy to use and keep the blanket securely in place, and the sand-resistant material helps to keep sand away from food and drink on the blanket as well as makes for easy clean-up. I have stored it in the glove compartment of my car, so I can always have it at the ready for beach days, picnics, outdoor concerts, and stargazing.